A trainee accountant who has achieved nationwide noteriety after allegedly hitting then tweeting about “#bloodycyclists” is reported to have been suspended from her job. 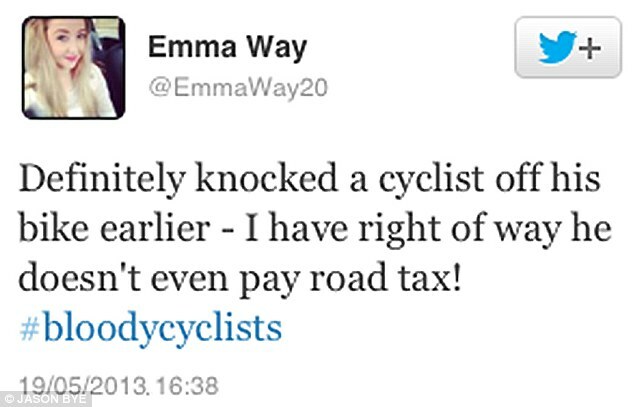 Emma Way tweeted that she had ‘definitely knocked a cyclist off his biker earlier – I have right of way he doesn’t even pay road tax #bloodycyclists’. As a result of her tweet, the Norfolk Police took up an investigation and the victim of the accident who has described himself as ‘lucky to be alive’ has been found. Ms Way’s driving was allegedly the cause for Toby Hockley ending up in a hedge after his handlebars were hit during a road race in Norfolk as Ms Way sped past. Ms Way’s employers, Norwich accountants Larking Goiwen, now appear to be caught in the middle of the news story. Ms Way has confirmed that she has now been suspended and fears her career ‘may be over’. Larking Goiwen are well advised to follow a sensible procedure and properly investigate any misconduct which it may find has taken place. With the media frenzy surrounding Ms Way at the moment, a suspension from her duties may take some attention away from her employers in the short term, but there is the risk that any media witch hunt may put pressure on them to make decisions against their own will. Ms Way’s story bears some resemblance to that of Paris Brown, the 17 year old ‘Youth’ Police Commissioner who resigned from her position after only a few days following a front page story in the Mail on Sunday. Ms Brown was found to have posted tweets some years earlier which were not considered appropriate for or consistent with her new role. Until her resignation, the Kent Police Commissioner stood behind Ms Brown and supported her recruitment, but once again, we are seeing how an instant message sent without thought or consideration can cause lasting damage. Tags: Accountant, Bloodycyclists, Commissioner, Cyclist, Emma, Employee, Employer, Employment, Expert, Larking Goiwen, Law, Mail, Media, Norfolk, Paris Brown, Police, Social, Sunday, Trainee, Way. Bookmark the permalink. Some resemblance? One was a teenager who said silly things, the other could have killed someone! Is this a story about Twitter or about a driver of a vehicle who should have, at the very least, stopped her car and checked that the cyclist was OK? For me that is the issue. As a passionate cyclist I have had many a brush with car users – some that could have led to me suffering personal injury – and although I have rarely Tweeted about things, I would hope my employer (me in my case) would have some sympathy with my position. We suffer people in our society drinking to near death without arresting or stopping them – but if you say something in the town square you will be fired or arrested? This is nonsense that ought to belong in the 1750s. Yes, the young lady isn’t using the best grammar – but that’s not the reason they are firing her, is it? Love how she seems apologetic for sending the tweet but not so much for almost killing someone! Stupid tweets and stupid driving are two very separate issues. Ms Brown wrote stupid opinions years before she was employed when she was 14. Ms Way wrote about stupid actions, as they happened, at 17. These incidences have little similarity. It’s normal for many employers to suspend employees who are being investigated by the police for allegedly committing a crime, this then leaves them to deal with the outcome, when it comes, appropriately. I agree, that if they are a responsible employer, they need to do their best to act without prejudice. But, while they consider their options they may feel that they have little choice but to suspend Ms Way until the police have concluded their investigation. If it ends up with her being found guilty of a crime then they will hopefully follow a responsible disciplinary procedure, or investigation to see if gross misconduct has occurred. Let’s be clear though, regardless of what Ms Way’s employers might decide this issue is less about that she tweeted and more about what that tweet contained. I note your comments Paul, but it was the content of Ms Brown’s tweets that was the issue too, even if those comments were made some years before. The furore surrounding the current incident is also a distinct similarity, risking the employer’s exposure in terms of reputation as well as potential criticism. True, however an employer standing by an employee because of something stupid said as a child is still quite different to distancing yourself from an employee who may have committed a criminal act, especially if it is in breach of their terms of employment. But yes, if we are just looking at the impact employees’ online behaviour can have on their employer then they are both good examples of this. I’m afraid I don’t agree that the same process should be followed with Ms Way as while the furore might be similar, the circumstances are not.